Babies Still Injured In Infant Walkers, Doctors Call For Ban : Shots - Health News Despite improved safety standards over the years, more than 230,000 children under 15 months old were treated in hospital emergency rooms for injuries related to infant walkers from 1990 through 2014. Skull fractures, concussions and broken bones are common injuries when children not yet able to walk use infant walkers and fall down stairs. 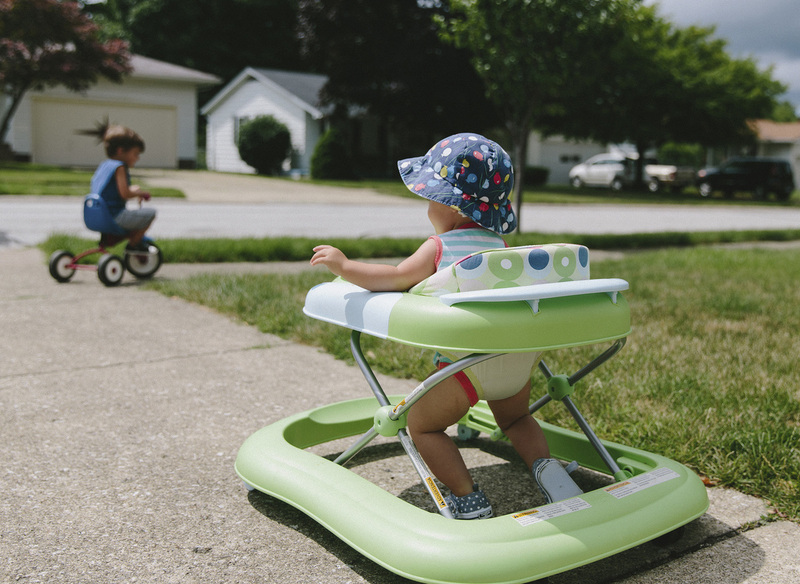 "I view infant walkers as inherently dangerous objects that have no benefit whatsoever and should not be sold in the U.S.," says Dr. Benjamin Hoffman, a pediatrician who chairs the American Academy of Pediatrics Committee on Injury, Violence and Poison Prevention. "Despite this great success, there are still 2,000 children a year being treated for injuries, many of them serious injuries, in emergency departments," says Dr. Gary Smith, the study's senior author and the director of the Center for Injury Research and Policy at Nationwide Children's Hospital in Columbus, Ohio. "Therefore, we support the position of the American Academy of Pediatrics that baby walkers should not be sold or used. There's absolutely no reason these products should still be on the market." Smith and Hoffman, who practices at the Oregon Health and Sciences University in Portland, agree that the study provides further proof that the CPSC should follow Canada's lead and ban the manufacture, sale and import of infant walkers. Canada banned the devices in 2004. The CPSC, an independent government safety agency comprising five presidential appointees, notes that the study shows that injuries have decreased significantly since the 2010 regulation. "CPSC continues to monitor the products' safety," it says in a statement to NPR. But doctors say the damage infant walkers can do to children's brains and bodies is not worth the risk of keeping them on the market. Smith has treated babies who landed head-first on concrete after falling down a flight of stairs while strapped into an infant walker. So has Dr. Jerri Rose, a pediatric emergency physician and professor at Case Western Reserve University School of Medicine in Cleveland. "They're really not safe," she says, especially because parents often use them as baby sitters so they can turn away and focus on other tasks. "Parents bought the myth that if they watched their children carefully they wouldn't get into trouble," he says. "But that was a myth." Also, many parents mistakenly believe that infant walkers can speed their children's ability to walk. But studies have shown that they might slow motor development, Rose says. It's not just infant walkers that cause injuries. Improper use of infant walkers, baby carriers, strollers, changing tables and bath seats brings children 3 years or younger into U.S. hospitals to be treated for injuries every eight minutes, a recent study showed, and these injuries are on the rise. Ronnie Cohen is a Northern California journalist who frequently writes about health. Follow her on Twitter @ronnie_cohen.